If you're teaching Woyzeck for Component Three's Section C, Intepreting a Performance Text this folder is for you. This teaching folder will provide you with a wealth of teaching ideas and resources to teach the entire play, from both a practical and theory-based perspective. Whether you want to dip in out of the folder, or follow it as a complete scheme, this will save you hours of planning. All teaching ideas and resources focus upon how directors can use theatrical conventions to interpret a performance text in light of whatever chosen practitioner you are studying for this component. 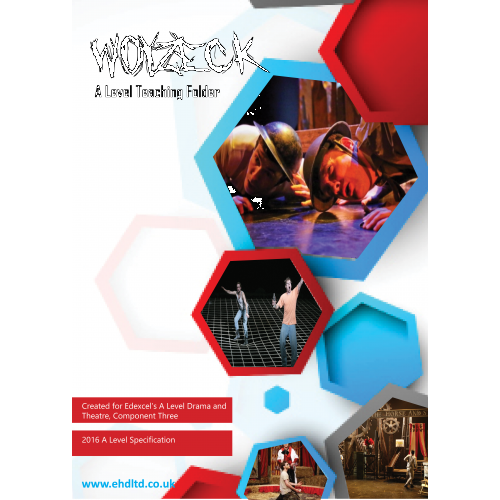 This folder will enable you to practically and theoretically explore the play in the light of your chosen practitioner and will provide you with a comprehensive set of resources to help students to develop their own production concept of Woyzeck. The folder covers the play scene by scene with teaching suggestions (and accompanying handouts) provided for all scenes so that your students will develop an integral understanding of the text as a whole in order to interpret it for a contemporary audience. All ideas and handouts focus upon the play from the role of a director (creating a production for a 21st century audience) and will provide students with detailed resources to help in their research of the play's original context, and the social, historical and cultural factors that are central to the context of the original text as well as the original aims and intentions of the playwright. -how a director tackles the playwright's fatalistic messages.